Coming home to a warm meal is a satisfying way to end a stressful day. A slow cooker can make creating delicious and nearly effortless meals an enjoyable experience for chefs of all ages and experience levels. With a little planning ahead and the help of some tried and true recipes, a crock-pot meal can be the perfect answer to weeknight dinners, special events, and more. If you’re in the market for a slow cooker, or looking to upgrade your current model, we’ve done some helpful research to help you make the right choice for your needs. Whether your needs are simple or varied, the size of your slow cooker is an important decision. Small, medium, or large crock-pots can accommodate different styles of cooking in many ways. Hopefully, reading through this material will help you decide which size is best for you. Having the ability to whip up a pot of stew, slow cooked beef, or hearty soup at the flip of a switch is what makes slow cookers so popular with busy chefs. Once you’ve decided on a model, check our library of crock-pot recipes to explore new dishes and try out the features on your new appliance. When purchasing an appliance, it’s important to understand the size and quality of the product that will serve you best. If you’re looking to save money when purchasing a slow cooker, buying small isn’t necessarily the answer. Different quality products come in all sizes. Be sure you choose the size and price that best fit your needs. 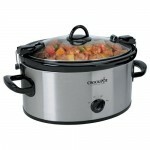 Choosing a small crock-pot could mean that you have specialized uses, a small group to feed, or low amounts of storage. We’ve made sure to provide a budget option as well as a high-end option to account for the tastes of all eager chefs. Despite being small in size, a top quality slow cooker will still feature safety functions and programmable settings like you would expect on larger units. Smaller models are perfect for those looking to start crock-pot cooking. Continue reading our reviews to find the right size and selection to begin your slow cooker adventure. If you’re looking for a budget friendly option that holds under 5 quarts, then the Proctor-Silex 33043 is for you. At 11.8 x 11.8 x 9.5 inches with a 4-quart capacity, it’s perfect for making smaller portion sizes and fitting into already limited cupboard space. The size is ideal for those cramped on budget and counter space that still want a reliable product. This slow cooker is easy on your finances while still providing an efficient crock-pot for preparing meals over time. The internal bowl is made of stoneware that is dishwasher safe. This makes keeping the slow cooker clean and looking new a breeze. At only 8.2 pounds, it’s easy to lift, clean, and move around. Made by the trusted brand, Hamilton Beach, this slow cooker is dependable despite its affordable price tag. Though not very technologically advanced, this slow cooker does offer a keep warm setting to allow for prolonged serving. More expensive models will offer programmable slow cookers that can cater to more specialized needs, but for the size and price tag this model holds its own. Its high and low settings are more than enough to accommodate for simple recipes for the unhurried chef. If you’re cooking for one or two people, this crock-pot is the ideal size. It allows you to make a reasonable portion without creating wasteful amounts of surplus. If you’re looking to save on expenses and space, the Proctor-Silex 33043 is an excellent choice for all your slow cooker needs. Programmable settings as well as a manual cooking function. If you’re interested in having a few more features but still wanting a smaller sized slow cooker, the Hamilton Beach 33957 is the way to go. Unlike the Proctor-Silex model, this crock-pot features programmable settings as well as a manual cooking function. It is compact, but allows for variable cooking temperatures and times for more manageable use. The appliance itself is a reasonable size for smaller households. At 16.7 x 12.3 x 11.2 inches and weighing only 12 pounds, it’s a smaller crock-pot that still delivers on programmable settings and features. It has a 5-quart capacity that allows you to create meals for one or two people with ease. Many of our tested and approved slow cooker recipes would go perfectly with this easy to use and capable model. No matter what you’re hoping to make, the size and features of the Hamilton Beach 33957 are a perfect match for chefs looking to explore the slow cooker world. It features a stoneware bowl and a glass lid, both of which are removable and can be put through the dishwasher without worry. The locking lid is an excellent feature if you plan to take your new slow cooker to an event. The tight seal will prevent any of your meals from leaking during transport. This model also features sturdy handles that make picking up and moving it a breeze, even when it’s full of your favorite hearty soup. If you’re looking for a mid-range level crock-pot that is ideal for single or small group uses, the Hamilton Beach 33957 is an excellent choice. It melds the convenience of a small size crock-pot with the programmable features of a high-end unit. While still being budget friendly, this model is perfect for those looking to explore the possibilities of a slow cooker in their cooking rotations. It’s a clear choice for anyone looking for a small and reliable kitchen addition. Sleek design and tech savvy controls. If you’re looking for a high-end slow cooker that still falls under the 5-quart cutoff, then this model is the perfect fit. The Cuisinart MSC-400 is for serious users looking to get the best product for their money. Its sleek design and tech savvy controls make it the ideal slow cooker for anyone interested in precision and lasting quality. While it’s still considered to be on the smaller side of most slow cookers, this model is exactly what you need for preparing meals for compact families. 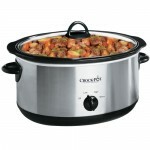 As an added bonus, this crock-pot can create a wider variety of meals compared with the above models. Like the smaller models we have mentioned, the Cuisinart MSC-400 features a machine washable interior bowl for easy cleaning. The tight-lock lid and bonus steaming rack are also safe to toss in your dishwasher. The stainless steel outer design is lightweight, easy to clean, and sturdy against scratches, bumps, or spills. At 10.5 x 16.5 x 8.7 inches and only 9.5 pounds, this model is light and easy to maneuver. It offers two sets of handles that allow you to lift both the entire unit and the inner bowl with ease. This is a great feature if you’re planning on taking the bowl from cooker to table. The sturdy handles are heat resistant and will protect your hands during transit. The technological advancements on this model reflect the price tag. With a large LCD display and easy-to-read time and temperature settings, this model gives you complete control over your finest recipes. It has three main settings that allow you to choose between steaming, sautéing/browning, and the classic slow cook. This adds a level of variety that other smaller models are lacking. If you’re looking for a high-end slow cooker that is sure to deliver on dependability, precision, and taste, then this is the ideal model for you. For anyone interested in the medium sized slow cooker options that are available, we’ve gathered three products that run the spectrum of budget friendly to high-end. We understand that everyone’s cooking needs differ. That’s why we strive to provide an accessible model for every type of chef. While spending more on a higher-end model may seem excessive to some, the added features that come with that bigger price tag are significant. Glass lids, secure latches, and programmable functions might make a difference in whether you use your crock-pot once a year or once a week. Hopefully, the options we provide for you here will help you to narrow down the right model for you and allow you to enjoy cooking with your new crock-pot frequently. These medium sized options are ideal for home chefs looking to explore the world of slow cooking and those who desire a bit more space for their favorite recipes. You can feed your averaged sized family in a quick and easy manner. This simple model is a real workhorse when it comes to slow cooking meals for medium sized groups and families. If you’re interested in preparing meals that can feed your averaged sized family in a quick and easy manner, then this slow cooker is an excellent option. The stainless steel outer finish on this slow cooker plus its convenient locking glass lid are sure to keep your food warm and your counter tops clean. The locking feature coupled with the sturdy transport handles make it easy to bring along to events that require something slow cooked and satisfying. The inner stoneware portion can be transferred with ease out of stainless steel shell. It’s perfect for serving right on your table or for keeping leftovers. As with all the other models, the inner stoneware bowl along with the locking glass lid are dishwasher-safe. This 6-quart model is just a slight step up from the smaller ones above, but that size can make a big difference in the variety of recipes you can create. At 10 x 15 x 15 inches and only 12.7 pounds, this is still an item that can be easily moved around your kitchen. The oval shape of this model allows the user to prepare larger meats, such as a six pound roast, with ease. The shape and 6-quart capacity make this model perfect for serving seven or more people depending on your recipe and portion sizes. With its straightforward high, low, and warm settings, this model is easy to use and provides a minimal amount of control for simple and satisfying recipes. Perfect blend of affordability and functionality. Definitely our favorite of the bunch, this Hamilton Beach model is the perfect blend of affordability and functionality. With the added bonus of coming from a trusted brand, this model is an ideal blend of size, features, and budget friendliness. The most unique feature to this model is the temperature probe. This allows the user to monitor the internal temperature of the meat as it cooks. The probe allows you to prepare pot roast, chicken, or pork tenderloin with ease. Simply insert the probe and set the temperature you want the meat to reach. This ensures you achieve the optimal temperatures when preparing dishes such as whole chickens, roasts, and more. 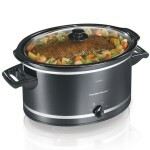 Similar to the other models, this Hamilton Beach slow cooker is easy to transport and cleans up efficiently. With a dishwasher safe inner bowl and a lightweight aluminum exterior, this model is sleek and built to last. It weighs 14.7 pounds and measures 16 x 10.25 x 16.13 inches in an oval shape, making it ideal for preparing whole meats. The size is enough for a small to medium sized family. It would be perfect for preparing recipes to share with coworkers or at other events that require transportable meals. The programmable settings give this model the high-end feel, but without the high-end price tag. Users can choose from three unique settings to create a variety of recipes all with one device. The three settings: program, probe and manual mode allow the user a level of control over the slow cooking process. The programmable setting will allow you to cook for a set amount of time with a keep warm setting that activates when ready. If you are looking to try traditional slow cooking methods, you can manually select either the high, low or warm temperature setting without setting a specific cook time. Aluminum crock-pot with a convenient, non-stick Teflon coating. 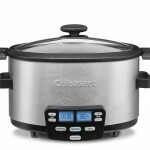 The high-end option for a medium sized 6-quart slow cooker is easily this MSC-600 model from Cuisinart. This aluminum crock-pot with a convenient, non-stick Teflon coating is the closest you can get to luxury when it comes to medium sized slow cookers. It offers many programmable features and a sturdy design that make the price tag reasonable for the amount of work you will get out of it. This model weighs an even 16 pounds and measures in at 19 x 12 x 9.5 inches. While a touch heavier than our other mid-sized options, this slow cooker is packed with features for the tech savvy chef to enjoy. It offers three programmable cooking functions that allow you to sauté your favorite vegetables, brown whole meats, and of course slow cook your favorite recipes all with one handy device. The included, extra-large steaming rack means you can also use this model to create healthy, steamed veggies with ease. The simplicity of the programming is helpful for beginning chefs. It offers a one-touch mode for when your recipe requires a combination of cooking times and temperatures. This is ideal for the more involved chef who loves having that extra element of control over their dishes. The large LCD display also features easy-to-read temperature and time settings so that you are able to use and enjoy your slow cooker. While the price tag on this model is quite hefty, the real value is in the amount of dishes you will be able to create and the longevity of the product itself. If you’re looking to invest in an appliance you will use often and for many years to come, this model is a perfect match. It provides top-of-the-line features with the security of a well-known brand standing behind it. If the small and medium sized versions we’ve showcased so far don’t quite fit your needs, then a larger model might be needed. In general, the larger models are not in as high demand as the small and medium models. This means that there is a general lack of high-end options in the large crock-pot category. Many larger slow cookers offer less features than their smaller counterparts, but the overall prices still tend to reflect in size. The ranges in size don’t necessarily indicate a range in quality when it comes to larger crock-pots. While we’ve provided three options in increasing size categories, we leave it up to you to decide which product will best serve your needs. If you’re in need of a slow cooker that can handle over 7 quarts, then these three options are the best of the best. Whichever you chose, we hope you enjoy using your new crock-pot to create bountiful recipes that can please a crowd. Easy to clean and able to hold a large amount. 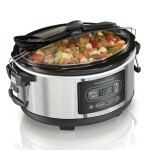 This 7-quart slow cooker is the smallest of our larger category slow cookers. While its settings and price tag may be simple, it is easily capable of preparing large, whole meats and serving upwards of 9 people. If you plan to use your slow cooker for larger, simplistic meals such as chilies and stews, then this model is perfect for you. The stoneware inner bowl is easy to clean and able to hold a large amount. Unlike the more feature friendly models we discussed earlier, however, this style features only simple grips. This could make transporting the bowl slightly more difficult. With the size of this model, you are more likely to serve your meal directly out of the unit instead of lifting the bowl over to the table on its own. The settings on this model are perfect for avoiding the complicated programming of more advanced models. High, low and warm settings are ideal for creating comforting meals, such as stews and sauces. The size also makes it great for creating recipes such as a seven pound roast with ease. If you’re feeding a large group, it’s a nice way to whip up a meal by letting it slow cook throughout the day and avoiding the bustle of a crowded kitchen. As with all models, this one offers the benefits of a dishwasher-safe stoneware bowl and glass lid. However, this lid does not feature any sort of locking mechanism. If you’re planning to use your crock-pot mostly in a stationary setting then this is not a problem. This is the type of thing you want to make sure to understand before making any purchasing decisions. At 12.5 pounds and measuring approximately 14.8 by 9.8 by 14.0 inches, this large style slow cooker is a powerhouse in the kitchen. If you have the counter space and need the benefits of size, it’s a classic model that is sure to get the job done. Simplistic style and hearty build. The next biggest size is this 8-quart model from Hamilton Beach. Its large size makes it an ideal choice for anyone needing to feed a large group on a regular basis. Again, it doesn’t necessarily measure up if you’re looking for a programmable slow cooker with the latest technology. However, the simplistic style and hearty build are perfect for creating meals in bulk without any flash. Measuring in at 11.6 H x 17.7 W x 11.6 D x 10.75 L (inches), it’s the right size for a large family or group. At this size, it can easily fit a 6 pound roast or 8 pounds of chicken. It has tons of potential uses at family gatherings, work events, or parties that require heaping servings to be kept warm and ready to eat. The low, high, and keep warm settings are more than enough to slow cook savory meats or keep a hot stew ready to serve. Though lacking in technological features, this model does feature something unique. Its mess-free lid rest allows you to clip the lid upright and out of the way for easy serving access. This feature is helpful when dealing with crowded buffet style tables where there is no room for the lid to rest. Keeping it close by in this manner will help keep the food inside warm and fresh throughout long serving periods. This model also features easy-grip outer handles and a dishwasher safe stoneware bowl & glass lid. Cleaning up after each use will keep this unit looking brand new for all your events. Do notice that this model does not feature a locking lid, which may make transporting your dishes more difficult. However, if you’re looking for a larger slow cooker that can handle the burden of a crowd this model from Hamilton Beach is a wonderful choice. The last and largest model on our list. The last and largest model on our list is the Elite Platinum MST-900V Maxi-Matic. 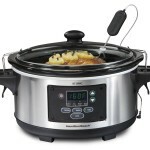 This 8.5-quart model is the best quality slow cooker in the largest size that you can find. Though fairly basic in its construction, this crock-pot can be a lifesaver if you need to prepare and keep warm a large quantity of food. The removable stoneware pot is large enough to prepare and serve your most hearty dishes. It is also dishwasher safe, making clean up easier than the cooking itself. The cool tough knobs on the sides of the inner bowl help protect your hands should you have to move it without the outer shell. Likewise, the knobs on the stainless steel exterior are study and built to withstand the weight of your meals. The settings are simple and easy to understand. Low, high, and keep warm are the only settings you have to worry about with this easy to use model. Plus, its oval shaped design and sturdy construction mean that you will never run out of space when using this model. It’s ideal for preparing meals in advance for large crowds that enjoy slow cooked meats, stews, sauces, and more. The clear glass lid, while not locking, does offer a clear view of what’s cooking inside. As we’ve mentioned with other models, you will want to keep this in mind if you’re hoping to move your slow cooker around a lot. If you plan to cook and serve all in one place, then the lack of a locking lid shouldn’t be an issue. Overall, this large model is an easy to use solution to the problem of feeding large groups. Its simplistic style and durable design mean you will be using it throughout the years to create impressive, crowd-pleasing meals. If you can handle the lack of programmable features and the stationary nature of the appliance, then this 8.5-quart slow cooker might be just the right choice for you. For chefs interested in using a slow cooker more often in their home kitchens, these choices will make your decision making process much easier. Depending on you goals for how you want to use your new slow cooker, it might be worth it to spring for a high-end model that can give you more variety. Or, you might be satisfied with one of the more simplistic and budget friendly styles we’ve shown. Once you’ve made your choice, don’t forget to check out our helpful articles on what types of meals you can start to make in your new slow cooker. There is so much more to cooking with a crock-pot than simply roasting meats. Explore new areas of cuisine with your slow cooker and enjoy recipes that are sure to become family favorites.